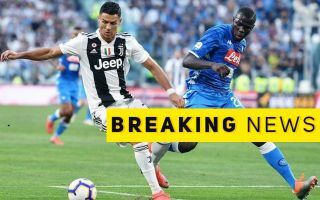 Juventus superstar Cristiano Ronaldo is reportedly eager to see his club beat the likes of Manchester United and Barcelona to the transfer of Ajax defender Matthijs de Ligt. The young Netherlands international looks a huge prospect with a great future in the game, and it seems more than likely that he’ll follow another exciting young team-mate of his in Frenkie de Jong in leaving Ajax this summer. According to Don Balon, Ronaldo has requested the signing of De Ligt for Juventus as he is said to be keen to have a team full of Galacticos in Turin. With the likes of Leonardo Bonucci and Giorgio Chiellini not getting any younger, a long-term replacement of De Ligt’s calibre could certainly be a worthwhile signing, with Don Balon suggesting he’d cost around £60million. This is not the first time the 19-year-old has been linked with Juve, with Tuttosport recently claiming talks were looking set to take place over a deal, though they also linked him as a target for Manchester United. The Red Devils could definitely also do with a top class young centre-back like this to set them up for the future, with the Dutchman surely a major upgrade on the likes of Eric Bailly, Phil Jones and Chris Smalling. However, it remains to be seen how this saga will pan out as Sport have claimed Barcelona look confident of doing a deal to sign De Ligt within the next month. If he does end up following De Jong to the Nou Camp, one could understand Ronaldo’s desire to stop it as it would surely put Barca in a strong position to dominate in the Champions League for years to come.